It’s that time of year again! The tree is up, the decorations are out and the presents are wrapped. We are even hoping that, just maybe, we will get a little snow on the beach this year. Unfortunately, white Christmases are pretty rare in southern North Carolina so we find ourselves looking below the waves for a bit of holiday inspiration. 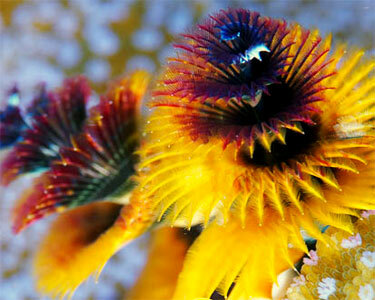 Christmas tree worms found bored into coral reefs. 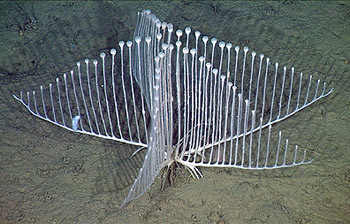 They extends twin spiral plumes to filter-feed on passing plankton. Like Old Navy sweaters, they come in a variety of colors, from orange and yellow to blue and white. The Candy Cane shrimp may not be peppermint flavored treats but they are well known for their natural ability to manage nuisance Aiptasia, or glass anemones. 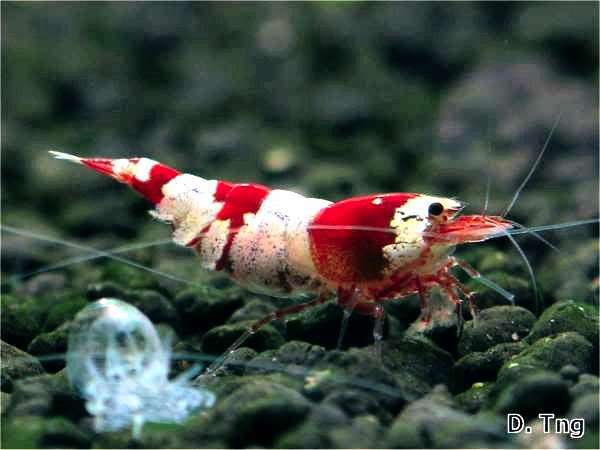 These small animals are considered part of the “cleaner” grouping of shrimp as they consume detritus, uneaten food, and decomposing organic material which makes them a great and colorful addition to home aquariums. Snowflake eels are not so great for snowman building but they are fantastic nocturnal ambush predators, striking at unknowing fish and crustaceans who wander by. Found in waters up to 35 feet deep, these eels are native to the caves and crevices of Indo-pacific reefs and are a bit shorter then most eels only growing to 3 feet in length. 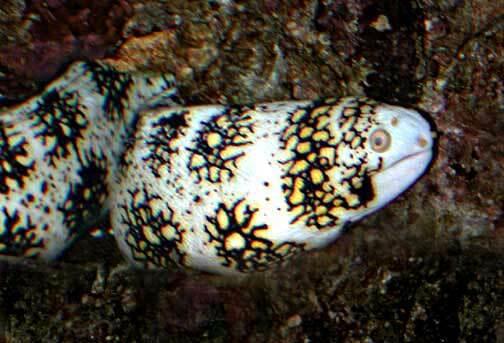 There unique pattern makes them easy to distinguish from most other eel species. 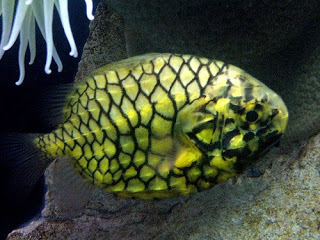 Pinecone fish looks lik e the real thing on land – no glue and glitter needed here! They are covered in very large, strong, platelike scales called scutes which are surrounded by a dark trim perfectly mimicking their terrestrial namesake. Spikes included! The first dorsal fin is composed of four to seven strong, disunited spines They are found lurking in caves and under ledges in the Indian and Western Pacific Oceans, and are a popular aquarium fish. 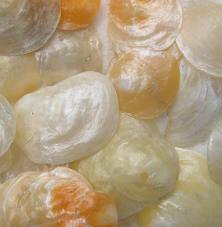 Jingle shells are bivalves found on the Atlantic coast amongst the more commonly known clams and oysters. The lower shell is glued to a hard surface, and after the mollusk is dead, the shell keeps its beautiful and shiny exterior. When strung together these creatures can sound like bells, hence the name. Harp Sponge – How Many Nights of Hanukkah? We think this sponge looks like a super-sized menorah! This newly-discovered carnivorous sponge was found using robotic submersibles operated by the Monterey Bay Aquarium Research Institute 10,000 feet below the surface in dark waters. Sea angles are tree toppers unlike any other! 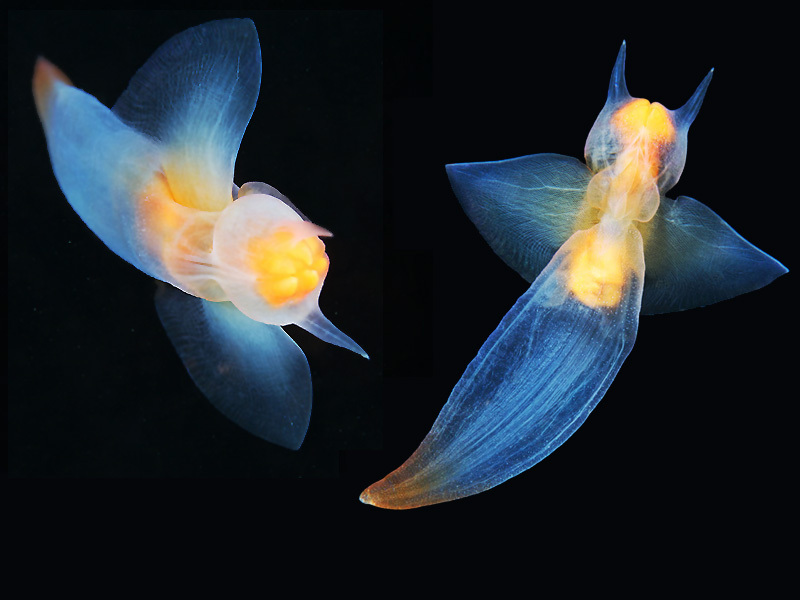 Reminiscent of a freshly made snow angel, these pteropods are actually shell-less sea snails. They flap their adapted foot ‘wings’ to get around in the water column. They are extremely small, with the largest species reaching only 5 centimeters long. We hope you enjoyed learning a little about how the ocean does celebrates the winter holiday and we wish you great joy and happiness this winter season.